The Icom M73EURO VHF has all the features required to make a highly reliable VHF including IPX8 submersion rating, 6 watts high output, long battery life and a compact ergonomic body. As such, it’s ideal for all leisure and commercial customers who want a solid, dependable handheld VHF that they can rely on! 700mW Loud Audio The IC-M73EURO uses a BTL (bridge-tied load) amplifier that doubles the audio output. Its internal speaker delivers a loud 700mW audio output with clear sound even in noisy environments. 6W RF Output Power The IC-M73EURO’s 6 Watts of transmit power will provide extended communication range for the user. *Typical operation with 5:5:90 duty ratio. IPX8 Advanced Waterproofing The IC-M73PLUS continues to offer Icom’s best waterproof protection. The radio has been tested to survive after being submersed in 1.5m (4.9ft) depth of water for 30 minutes. 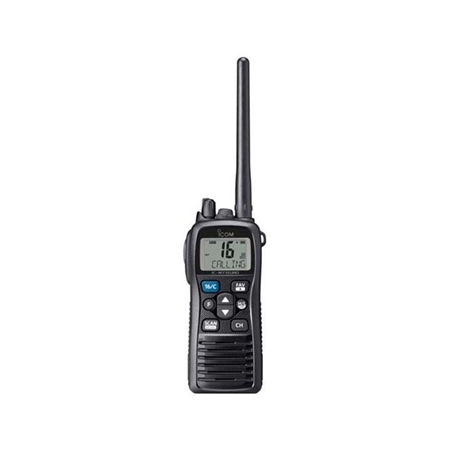 Use this radio in the rain, snow or any other severe weather conditions! Slim, Hourglass Body, Wide Viewing Angle LCD The IC-M73EURO has a stylish, ergonomic design. A durable and rugged body provides for user friendly operation and long life. A wide viewing angle, high intensity LCD offers bright, easy to read characters. - AquaQuake water draining function ejects water from the speaker grill with low frequency sound. Bought as a back up for ICOM 323 best handheld I have owned. User friendly controls long battery life would not be without it.